You are here: Home / BLOGS / Blogs / I’m 100% Certain About That…..
I’m 100% Certain About That…..
I’m 100% Certain About That…. I’ve just arrived home after being away for work all week. For almost all of the two hour drive home, I was tracking parallel to storm clouds all around me, and on the radio, the broadcast was regularly interrupted with ‘weather alerts’ warning of severe storms in my area. 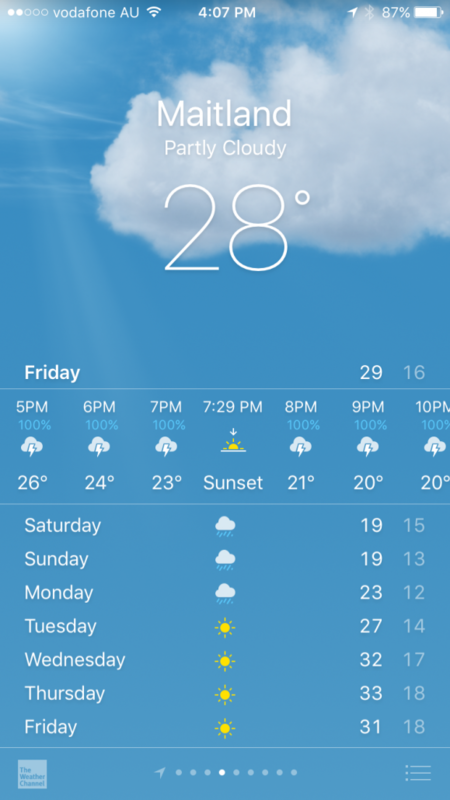 When I arrived home I checked out the weather radar application on my phone and sure enough it seems that storms are tracking my way. I then checked my weather forecasting application, and not surprisingly, it is predicting storms over the next few hours. Not only is it predicting storms to happen, it is suggesting that there is 100% chance of them occurring (check out the photo with this story). This got me thinking about what 100% ‘chance’ actually means? 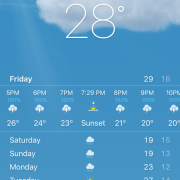 Do this mean that rain will definitely fall in all of areas in which I live during all of the times that it is predicted? I wonder whether we really understand the numbers that we use so regularly in prediction, particularly in risk? Could it be that everyone may not understand these numbers in the same way? If we don’t all have the same understanding of the references that we use when communicating about risk, what does this mean when we agree on a risk score? What impact may this have on how we deal with, and understand risk? I wonder how this may play out in risk and safety? I wonder whether Gigerenzer can help all of us in risk and safety to become more risk savvy. The question is, are we prepared to explore these questions or are we stuck in blissful ignorance believing that everyone is thinking in the same way about risk? Do we need better and more meaningful conversations with each other in order to better understand what we mean when talking about risk? Update; its just hit 5.25pm and it isn’t raining yet. I guess that means that 100% does not mean it will rain during 100% of the time that it was predicted. I wonder what it does mean though? We’d love to hear your thoughts, experiences and comments. Efficiency, Control and Their Affect on Others Not Much Like Safety….